Look for a sunny location in your yard. Ideally, an area that gets about eight hours or more of direct sunlight. The area should also have good drainage. If the area you want to grow your vegetables doesnt drain well or is always wet, you may want to create raised planting areas or grow your vegetables in containers. Every year it is important to add compost to your soil to help maintain good texture, providing the necessary nutrients for vegetables to produce well. For every 100 square feet, we recommend using 2 bags of Gold Rush (a high quality fir mulch with 15% chicken manure) and 1 bag of PayDirt(a premium organic soil builder). In addition, we recommend adding Gypsum to your vegetable garden. Gypsum not only helps loosen your soil, but also provides a valuable source of calcium which helps prevent blossom end rot on tomatoes. Finally, add Master Start at the rate of 2 pounds per 100 sq. ft. or EB Stone Tomato & Vegetable Food at a rate of 4 pounds per 100 sq.ft. to your garden. Both are excellent starting fertilizer that provides many necessary nutrients needed for the development of your vegetables. Spread the compost, gypsum, and Master Start evenly over your area and turn into the top 6 inches of your soil. 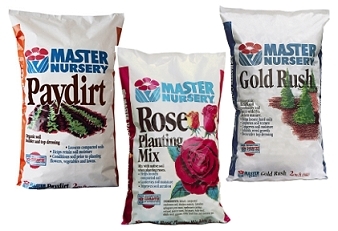 If you are planting in containers or are filling raised beds, you may consider using the Rose Planting Mix. This amazing compost blend has produced excellent results when used in vegetable beds. Water is important for a good garden, but it is important not to overwater. For optimal performance, vegetables need enough water to keep the soil around their roots moist, but not drenched. Young plants need more frequent watering, while more mature plants may only need watering once or twice a week. Watering thoroughly once a week is better than watering a little every day. During hot weather, additional watering may be necessary, especially if the plants are not well established. Plants need nutrients to grow and thrive. 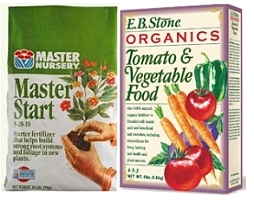 We recommend fertilizing with Master Start(5-20-10 with micronutrients) or the EB Stone Vegetable Food every 6 weeks. It is important to make sure the soil is moist before applying fertilizer and water thoroughly after applying the fertilizer to avoid burning the plants. Insects can cause a lot of damage in your garden if not controlled. We recommend inspecting your vegetables often, especially when the plants are young, to keep bug problems under control. There are many safe and effective methods for insect control. For specific information about pests in your garden, please ask us at Mid City Nusery.